And imagine what New York would look like if they started getting their way in, say, 1900. Affordable housing is the Mayor’s and city Council’s requirements if you want to exceed what is allowed “as a right” under current zoning. It is not my idea or goal. I personally feel that a building that has a high volume store like a Target should not be allowed to get any bigger because it creates more problems with traffic and deliveries. "And imagine what New York would look like if they started getting their way in, say, 1900." Not sure what your point is M7X7, but anyway, perhaps you should look into overcrowded conditions/tenement life in NYC at the turn of the century. It's not a pretty picture. Which is why communities like Jackson Height exist in the first place. Seem like some people in the neighborhood want to pull the ladder up behind them once they got theirs. In major cities, things change, neighborhood evolve. I for one, saw 1 movie there in 20 years so perhaps something new in that space isnt the end of the world as we know it. Paul, take a minute to refresh yourself on how to quote a previous post. I had to put glasses on to read yours. My point is that it's not a reasonable demand to halt development when demand is growing, and if you try then you end up with a housing crisis. The point of the comment about 1900 is that much of the city, including all of our skyscrapers and Jackson Heights itself, was built after that time and would not exist if NIMBY's from that era got their way. Family, we’d like to share some exciting news-- as of August 29th, the Department of Buildings will be issuing a stop work order and move to revoke the permit at 40-31 82nd Street. See the attached photos of the document signed by the Queens Borough Commissioner at the Department of Buildings, Derek Lee. (2) Because the DOB has revoked the permits for the site, the developer’s plans for the site are no longer legal and that means ALL CONSTRUCTION AT THE SITE MUST STOP. If you see or hear any construction at the site, CALL 311 immediately to report a “violation of a stop work order”!! (3) We believe the DOB’s decision for our site may have huge consequences across the city in the fight against corporate chain and big box store takeover. If the DOB believes that sites zoned similarly to ours cannot legally accommodate a big box store like Target, what does that mean for the planned, but unbuilt Targets like those in Astoria and the Upper East Side? What could it mean for Target locations that have already been built, like the East Village location? This decision is a major blow to the plans of the developers, Sun Equity Partners and Heskel Group, the politicians who have been in lock-step with them since day one (Council Member Francisco Moya, Queens Borough President Melinda Katz, and Ari Espinal), and the corporate lackeys at the 82nd Street Partnership who have been fronting like they support small businesses while systematically welcoming corporations and developers into the neighborhood with open arms. We’d like to thank the community members who submitted challenges and supported the research in this, as well as those who have continued to sign the pledge to not shop at the 82nd Street Target, should it ever be built! Stay with us, family, and keep your eyes and pressure on the developers and their minions. If Target isn't allowed...does that mean we'll probably get a "Dollar Tree" instead? I have to admit that I always thought the zoning there would not allow a big box store like Target to open. What is the zoning there? I believe that the Sterling bank site at 73rd Street and Broadway which is zoned C4-3 would allow a small target to open. Target will probably look at that site next. I have to be honest - not jazzed to hear this news. I guess I am of the unpopular opinion that the proposed Target would vastly improve the quality of the block (at the very least aesthetically), potentially offer more jobs to the residents of the area, and even attract more people from different areas to JH to eat/shop/etc. I definitely wasn't thrilled about 13-story "luxury" condos, but leaving this an empty lot is not a solution and is actually worse for the area. I'm not sure the Queens United folks have their facts right. I went to the DOB website and there is no evidence that the project is not going forward. There is a filing showing that the contractor has been fined $2400 and is in violation of DOB rules due to creating excessive debris at the site. The contractor has been ordered to rectify the matter. With regard to "big box" stores, Target and other retailers are opening stores throughout the U.S. that are of a variety of sizes. Some are the standard massive big box stores like you might see in the suburbs. Others aren't. Target, for one, has been creating smaller stores for urban markets...so to say that Target will be prohibited from building there is incorrect. I don't see anything in the zoning that prohibits Target. Based on the renderings that have been submitted by their architects it looks like they are planning three floors of commercial. Maybe that's a big box, maybe not. Personally, I don't think that's a great site for any large development whether it be an office building, apartments or a multi-story retailer. That street is already a disaster. That said, I don't see why there is such opposition to a Target. The neighborhood needs better stores that offer a variety of merchandise at reasonable prices. Target has a pretty good selection and pretty good prices. But if you disagree you're free to shop elsewhere. On the other side of 82nd, there's OLD NAVY, GAP & BANANA REPUBLIC and these franchises are crowded with immigrants buying stuff. I'd say any Target that opens up will also be overflowing with folks in pursuit of the American Dream. 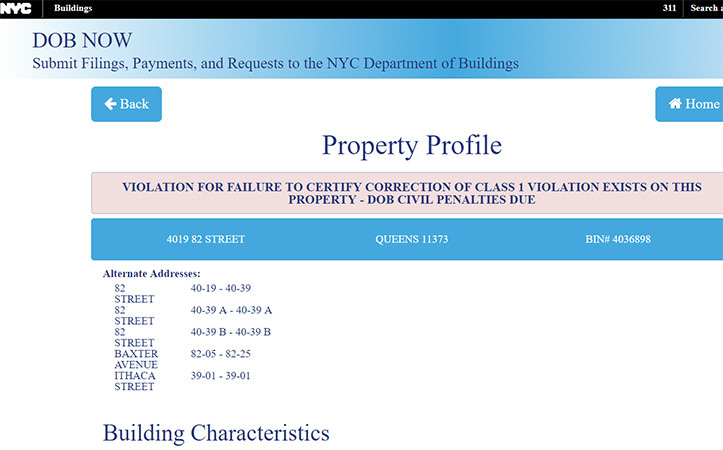 If you look at the snippet of the DOB document it cites 40-19 82nd st. The old theater was 40-31. I noticed that as well, but I think many times buildings have more than one address. In this case, I looked up 40-19 82nd St. on the DOB site and it came up with multiple alternative addresses.